The main function of RNA was identified early on as being a template – in the form of messenger RNA that reflects the encoding of genes in DNA – for the construction of proteins. A few other forms of RNA were also recognized as playing a well-defined but subsidiary role in this process. However, research within the past five years has established that only 10 to 20% of RNA transcribed from DNA actually serves as a template for proteins. The function of much of the remaining transcribed RNA is generally unknown. Many of these RNAs are short, with only a few tens of nucleotides, such as microRNA (miRNA). About 1000 different forms of miRNA have beein identified in the human genome, and the effective role of many of these has been discovered. Longer forms of non-coding RNA, having more that 200 nucleotides, are known simply as long non-coding RNA (lncRNA). Only about 100 have been studied in mammalian tissues so far. The function of only a few of these has been determined. For example, one type is important in regulating stem cells during embryonic development. Now another lncRNA has been found to play an important role in the maturation of red blood cells. A long non-coding RNA (lncRNA) regulates programmed cell death during one of the final stages of red blood cell differentiation, according to Whitehead Institute researchers. This is the first time a lncRNA has been found to play a role in red blood cell development and the first time a lncRNA has been shown to affect programmed cell death. LincRNAs (long intergenic non-coding RNAs) seem to be the flavor du jour for researchers studying the many functions of various types of RNA, in addition to the traditional role of carrying genetic information from DNA to the cellular structures where proteins are made. Very recent research showed that lincRNAs regulate gene expression in embryonic stem cells. 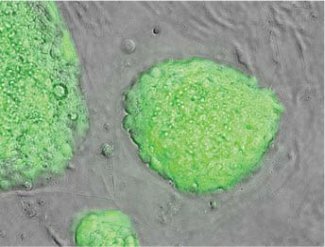 Another lab has now come up with a technique for determining exactly where on a cell’s chromosones a given lincRNA binds in order to regulate gene expression. A new technique developed by researchers at the Stanford University School of Medicine allows researchers to identify the exact DNA sequences and locations bound by regulatory RNAs. This information is necessary to understand how the recently identified RNA molecules control the expression of neighboring and distant genes. This research greatly improves lab techniques for studying lincRNA, but doesn’t itself identify new functions. Traditionally, the roles of only a few types of RNA have been understood for the significant part they play in cell biology. The short list includes messenger RNA, transfer RNA, and ribosomal RNA. More recently, other types have been added: mircroRNA, small interfering RNA, and antisense RNA. But that hardly exhausts the list. A more recently discovered type of RNA is large, intergenic non-coding RNA (lincRNA), a particular subtype of long non-coding RNA. LincRNA are so-named because they are not derived from gene-coding DNA, but instead from stretches of DNA lying between genes. New research suggests that an important function of some lincRNAs is to regulate the development of embryonic stem cells in the earliest stages of embryo develpment.